Today I wake up early, 5:40 to be exact. I like it when that happens and I feel well rested. I just can't rave enough about the relaxing effect that babbling brook outside my open bedroom window has on me. The day starts with a good dose of the novel I'm currently reading 'book style.' I say that because I always have more than one 'book' going at a time: one non-fiction, one fiction that I read and at least one that I'm listening to (could be fiction or non). I've been subscribing to audible.com for over ten years and have more than 600 books in my audible library. I love listening while driving, knitting, exercising, cooking, or just sitting and listening. We're really getting into this life-style, the kids and me. Glenyan RV Park is one busy park; although it appears that all campers are pretty used to camping, respect others' privacy and monitor their pets, etc. There are lots of permanent residents and extended-stay folks, along with a hefty number of one-nighters. My site is nestled in a group of pine trees (I believe in an earlier blog I mistakenly said redwood trees - that's the Marin County, CA in me! Big trees - must be redwoods). But there are some hunkin' pines; I noticed one this evening with very interesting looking bark on the 50 foot high trunk; I'm going to try to remember to take a pic tomorrow. I have loved to cook all my life, having had wonderful mentors, and am so enjoying the fact that I now have the time to actually make it my project of the day if I care to. After my dose of fiction I casually clean up and get dressed and head into town to have coffee and conversation with a few new acquaintances for an hour or so. Then I stop at a bakery called "Four and Twenty Blackbirds" and buy a two-serving Marionberry Pie with a graham flour crust and streusel topping - for dessert later today. If you haven't ever had Marionberries, they're divine .... They're a subspecies of blackberry that was developed by the USDA and Oregon state University, and is very hardy here in Oregon, accounting for over 50% of the blackberries grown in this State. One more chore to do before I begin cooking - and eating - this morning. I park Petunia in an adjacent spot and batten down the hatches so I can drive Floribunda to the dump station. I'm still not completely comfortable with my black and gray water lights inside the coach. I don't think the tanks are completely full, but they're reading 'full' so I drive the rig to the front of the camp and do the duty. I have one of those sprayers to 'clean' the black holding tank, but when I'm completely finished with dumping, filling, dumping again, spraying and dumping again, the console still registers 3/4 full. Does anybody know of something to dissolve gunk in the black water tank? The gray water tank registers empty after the dumping process. I really do suspect that the black water tank is empty too. I return indoors and make a nice pot of spaghetti sauce (or 'gravy,' as my girlfriend's Italian mother calls it), one serving for today's repast and three for the freezer for later. Not a magazine-quality presentation, but after simmering all, including beef, onions, garlic, mushrooms, tomatoes and spices for about 6 hours, it's pretty yummy. I ate one serving and followed it with half of the Marionberry pie - good good good. 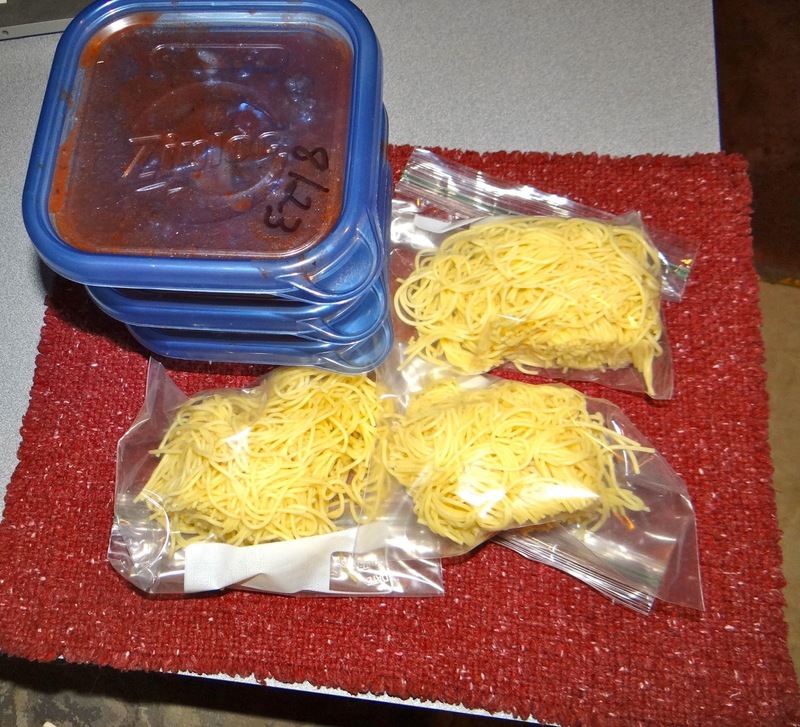 I make individual freezer bags of vermicelli and San Francisco sour dough bread to complete the project - and voila! One meal for today and three meals ready for future good eats. I like to make enough so that I can have yummy meals even when there's no time to cook. I also have three meals of pork chops in mustard-cream sauce with rice pilaf that I prepared earlier this week. I have developed the habit of eating my big meal of the day at what we call "lunch time;" it's the time of the day when I'm most hungry and I think it might be better for me too. In Guatemala it's called "almuerzo;" I ate 'dinner' then returned to school for two more hours of Spanish lessons. And tonight it's blog time and soon I'll be back to that novel, "Those Who Save Us," by Jenna Blum, a professor at Boston University. Happy Saturday all. Thanks for the tips; I'd read the one about the ice but had forgotten it. I'll be dumping again on Wednesday when I leave here and I think I'll throw a bag of ice for the drive. The RV park at Crater Lake (actually Prospect, Oregon) has a full hookup so I can empty again when I get there. because I've been guessing about how full the tank is I've hesitated to put too much water in the black tank when I flush. Think I'll get some liquid Calgon and use that with some Dawn. I'm going to start following your blog - are you in Texas? Yes, unfortunately just a part-timer but for more years than I care to mention. DH doesn't love RVing like I do so it is usually the dachsies and me when I hit the road...sometimes married son and family now that they live very near San Antonio like I do. Plan to be out this coming weekend...can't wait any longer even if it is 100 degrees. Love to meet you one of these days.